2Arbeitsgruppe Atmosphärische Prozesse (AGAP), Munich, Germany. Received 23 August 2011; revised 30 September 2011; accepted 17 October 2011.
are based on meritless conjectures. quested by the IJMPB—the manuscript of Halpern et al. by the reviewers were removed from the manuscript. discipline of climatology has lost its rational basis. 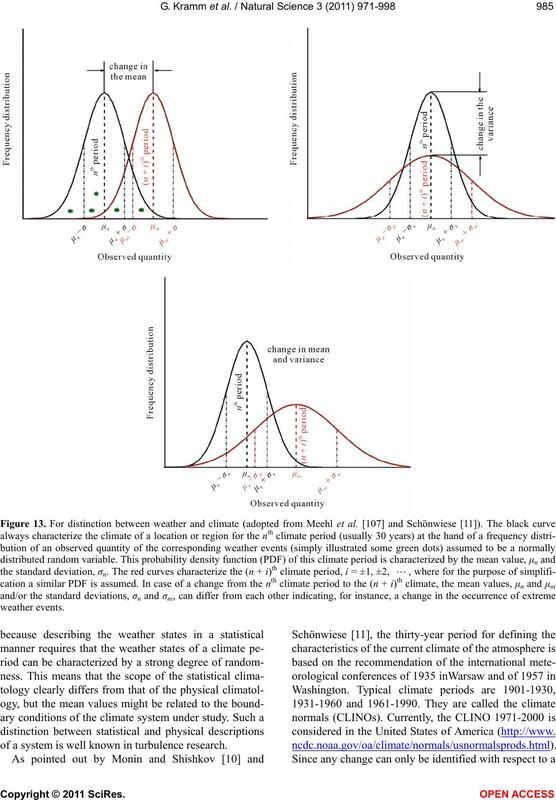 ity, climate change and climate variation in Section 2.
long-term periods of the past. Cwb and Cwc), 12 cold (Dsa, Dsb, Dsc, Dsd, Dfa, Dfb, Dfc, Dfd, Dwa, Dwb, Dwc and Dwd) and 2 polar (ET and EF). criteria (adopted from Peel et al. ). summer then Pthreshold = 2 × MAT + 28, otherwise Pthreshold = 2 × MAT + 14). stices, respectively. They mirror their present-day locations. geometry is indispensable and outlined here. major axis. This is the content of Kepler’s third law. orbit around the Sun in an ideal manner. 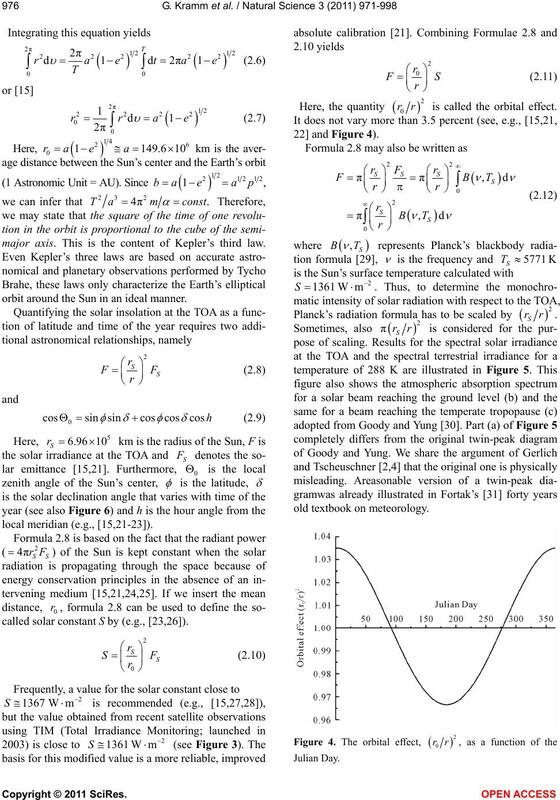 called solar constant S by (e.g., [23,26]). rr is called the orbital effect. reaching the temperate tropopause (adopted from Goody and Yung ). periodically during such long-term periods. 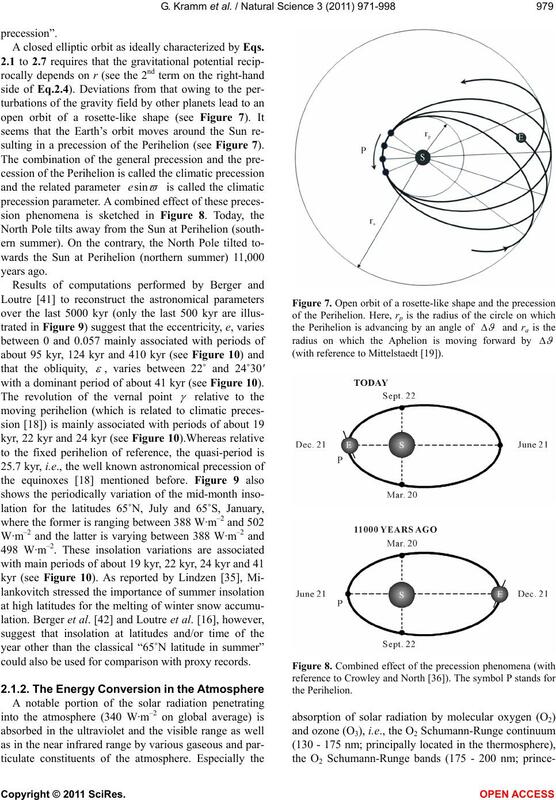 Precession and the Ecliptic published by Hilton et al. A closed elliptic orbit as ideally characterized by Eqs. 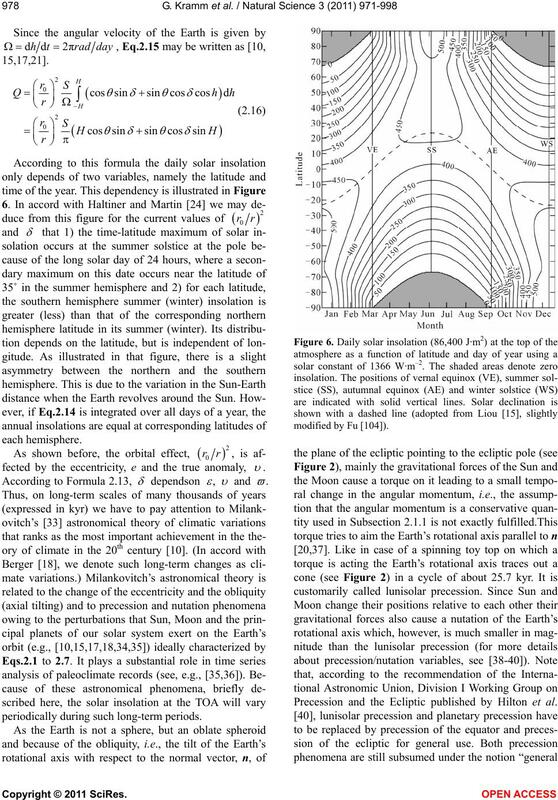 sulting in a precession of the Perihelion (see Figure 7). with a dominant period of about 41 kyr (see Figure 10). could also be used for comparison with proxy records. (with reference to Mittelstaedt ). data are taken from Berger and Loutre [41,105]). tude of 65˚N deter-mined by FFT (Welch) on the basis of the orbital data of Berger and Loutre [41,105]. in the visible range, too. According to Trenberth et al. 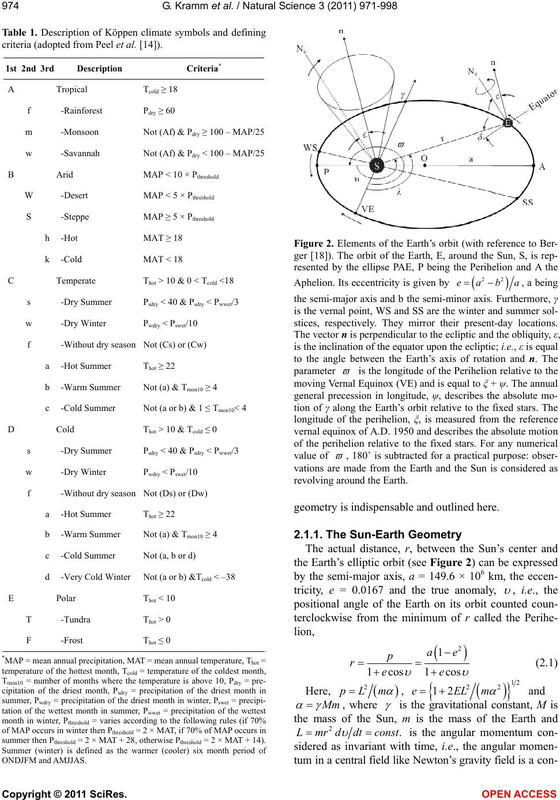 Earth-atmosphere system (see Table 2). sources [24,44] and  are inserted and source  is updated. transfer on the planetary scale. where most of it is absorbed. up-welling from the earth’s surface . can be parameterized by . Su et al. , Pyles et al. 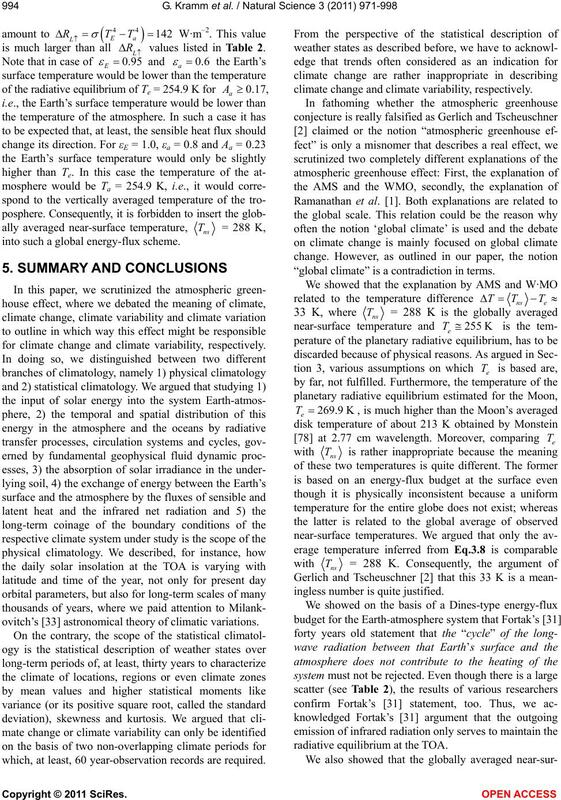 [61,62] and Mölders et al. [63,64]. 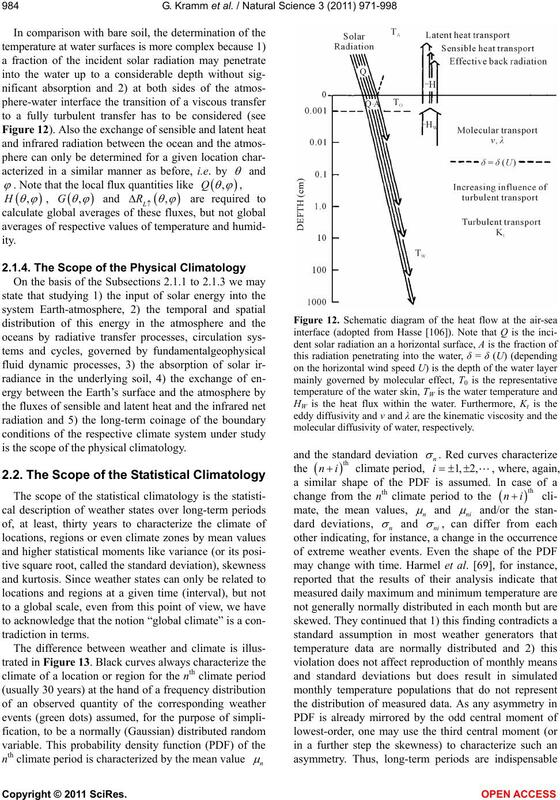 is the scope of the physical climatology. molecular diffusivity of water, respectively. of a system is well known in turbulence research. considered in the United States of America (http://www. 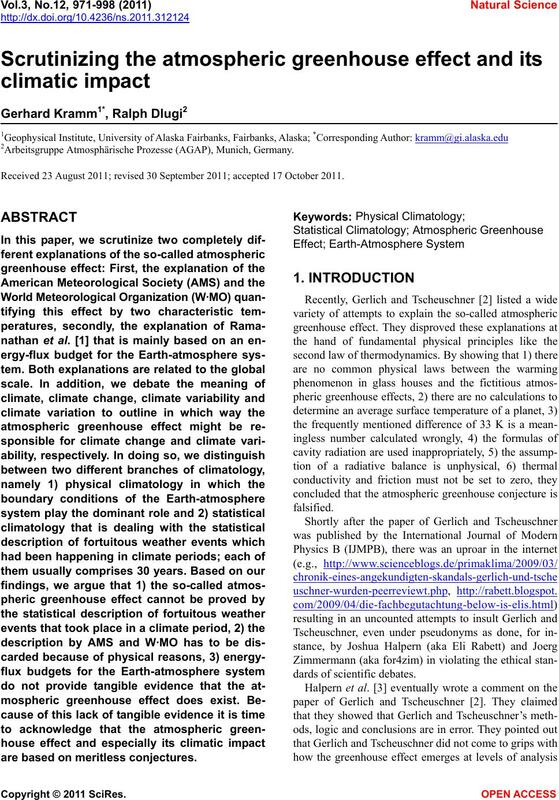 change and climate variability, respectively. be helpful in this matter. would occur if only the direct sunlight were absorbed. 1961-1990. The quantity R is the correlation coefficient. albedo of the Earth’s surface. , will be given by . we will obtain (e.g., [15,26,27,70-72]). Möller —to our best knowledge—introduced Eqs. and land masses is neglected. 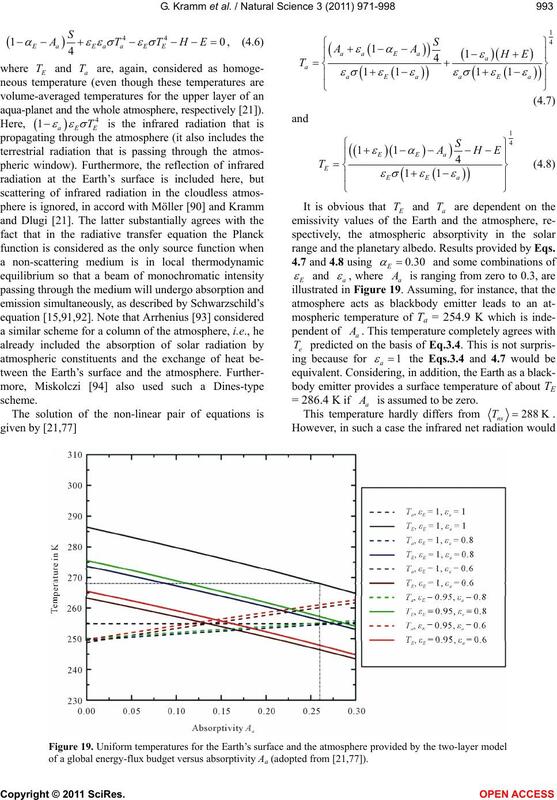 tion of a uniform surface temperature cannot be justified. averaged near-surface temperature of the Earth. the schematic flow of energy in proportion to their importance (adopted from Trenberth et al. ). 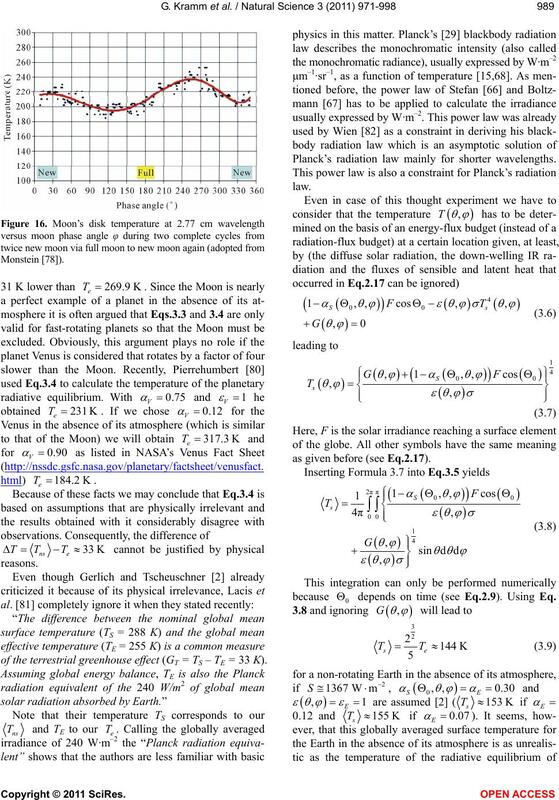 of the terrestrial greenhouse effect (GT = TS – TE = 33 K). Planck’s radiation law mainly for shorter wavelengths. as given before (see Eq.2.17). depends on time (see Eq.2.9). Using Eq. significant reduction in the long-wave emission to space. about 390 W·m–2 is meaningless. Figure 17. 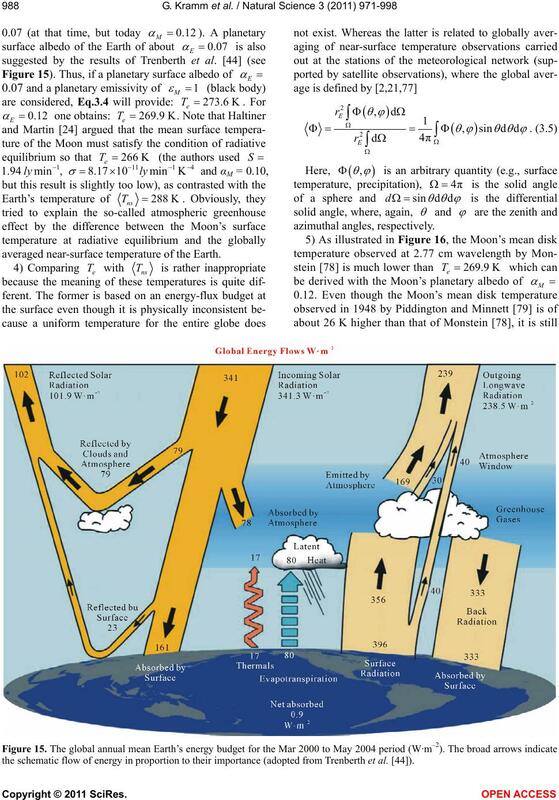 Global energy balance and the greenhouse effect (adopted from Ramanathan et al., ). reaching the TOA as expressed by Eq.2.12. Summary for Policymakers, with respect to Forster et al. ). 46 W·m–2 to 72 W·m–2. is linked to the reservoir of latent energy (see Figure 11). equilibrium at the TOA (see Eq.4.1). Haltiner and Martin , Möller , Ramanathan et al. aqua-planet and the whole atmosphere, respectively ). range and the planetary albedo. Results provided by Eqs. is assumed to be zero. 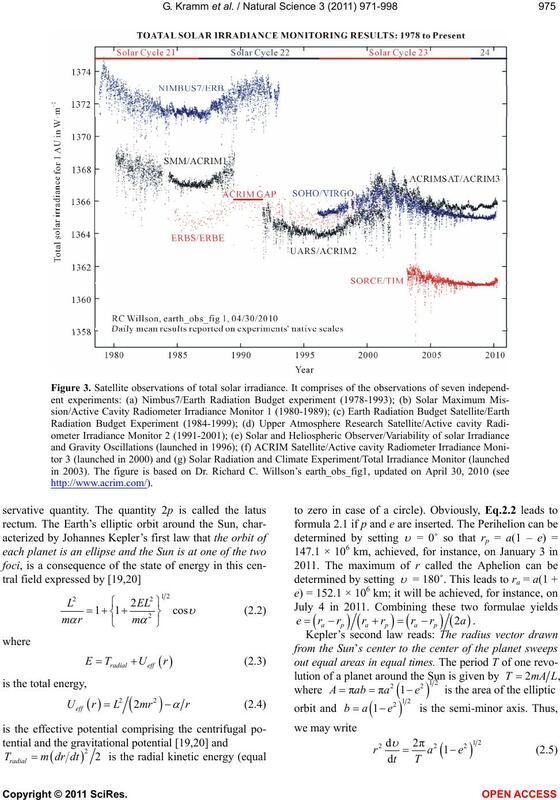 of a global energy-flux budget versus absorptivity Aa (adopted from [21,77]). 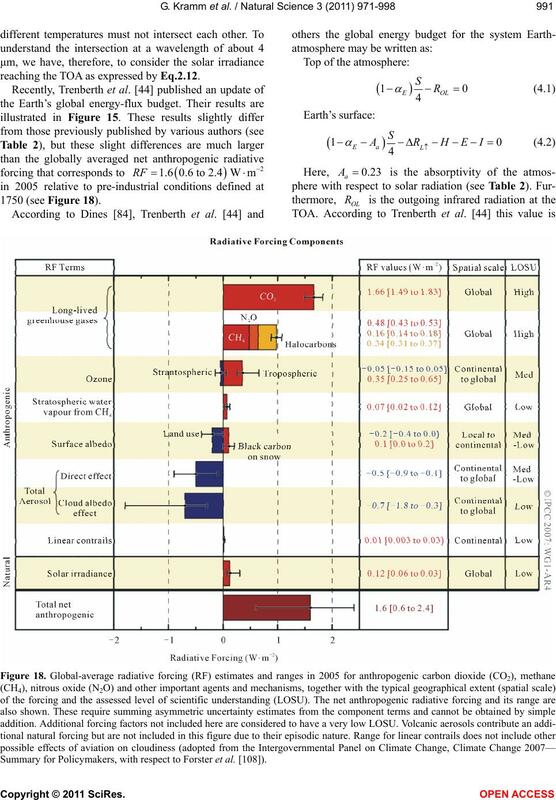  values listed in Table 2.
into such a global energy-flux scheme. for climate change and climate variability, respectively. 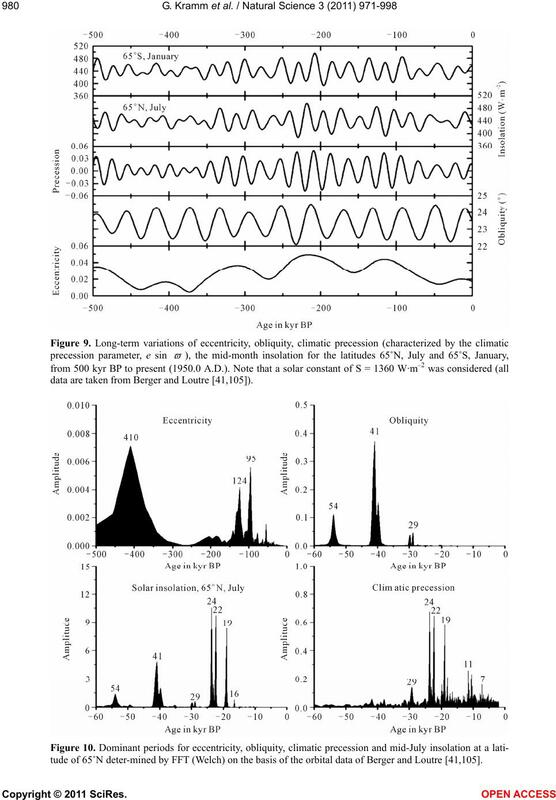 ovitch’s  astronomical theory of climatic variations. which, at least, 60 year-observation records are required. climate change and climate variability, respectively. “global climate” is a contradiction in terms. ingless number is quite justified. radiative equilibrium at the TOA. T are volume-averaged quantities . climatic impact are based on meritless conjectures. 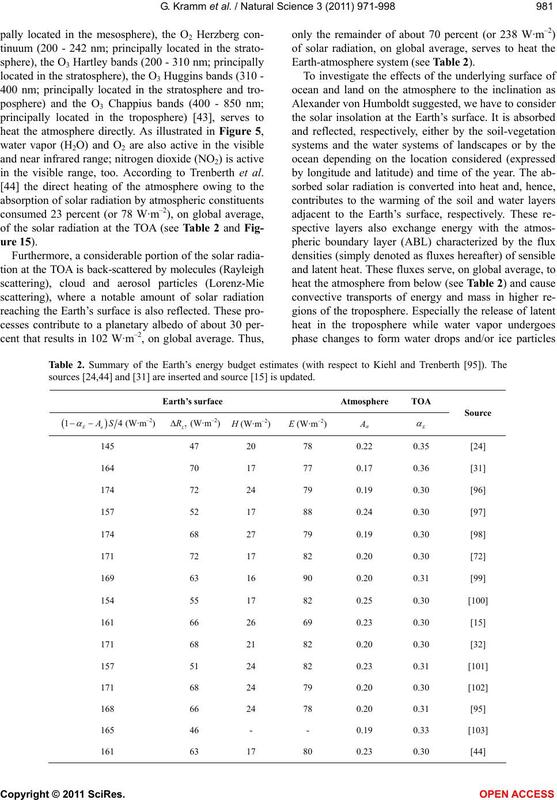 I., Kuhn, W., Lacis, A., Luther, F., Mahlman, J., Reck, R.
tions and effects of changing atmospheric trace gases. 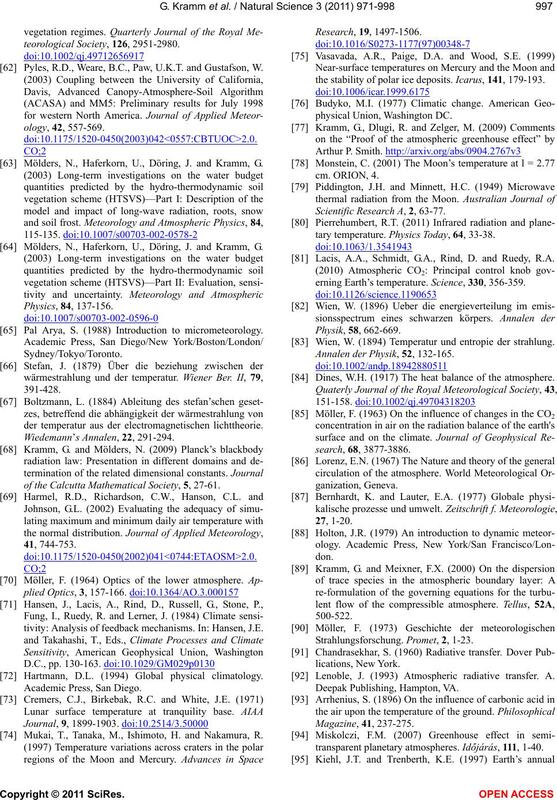 Reviews of Geophysics, 25, 1441-1482. Modern Physics B, 24, 1309-1332. Stuart, Joel D. Shore, Arthur P. Smith, Jorg Zimmermann”. 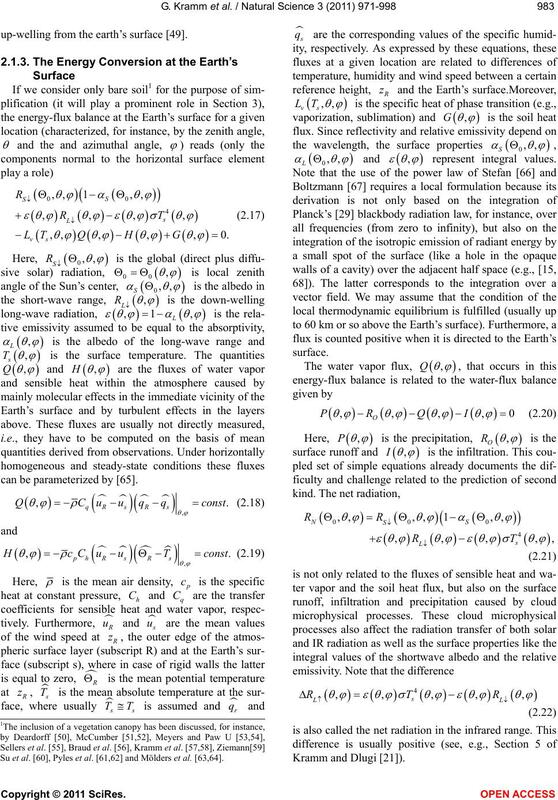 tional Journal of Heat and Mass Transfer, 50, 702-712. Wright, S.E., Scott, D.S., Haddow, J.B. and Rosen, M.A. Planeten. Walter de Gruyter, Berlin/New York, 311-426.
tion—Second edition. Academic Press, San Diego. Loutre, M.F., Paillard, D., Vimeux, F. and Cortijo, E.
views of Geophysics, 24, 624-657. Kondratyev, K.Y. (1969) Radiation in the Atmosphere. climate. Oxford University Press, Oxford. Petty, G.W. 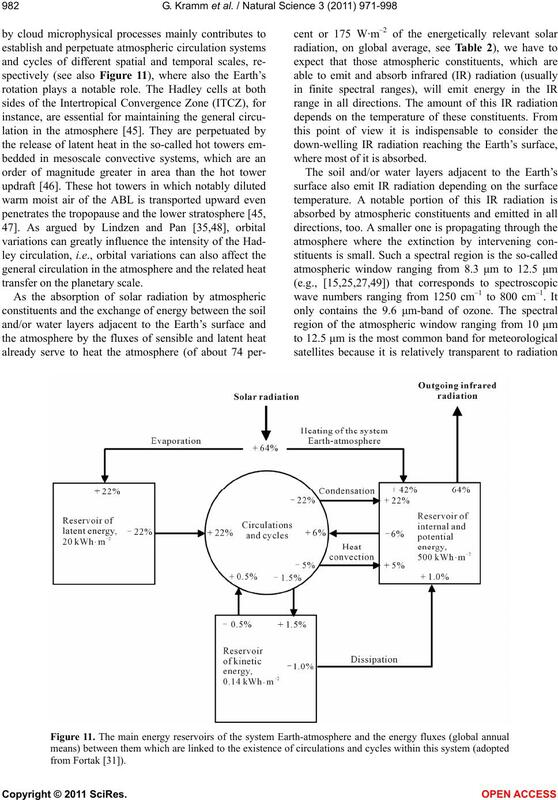 (2004) A first course in atmospheric radiation. im normalspectrum. Annalen der Physik, 4, 553-563. 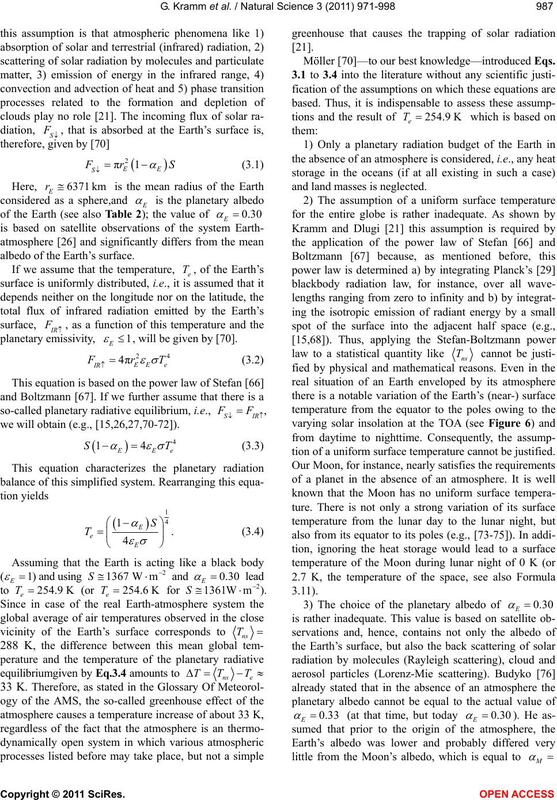 Peixoto, J.P. and Oort, A.H. (1992) Physics of climate. American Institute of Physics, New York. systeme solaire. Astronomy & Astrophysics, 30, 141-154.
change. Annual Review of Fluid Mechanics, 26, 353-378. Crowley, T.J. and North, G.R. (1991) Paleoclimatology. omy & Astrophysics, 432, 355-367.
data. 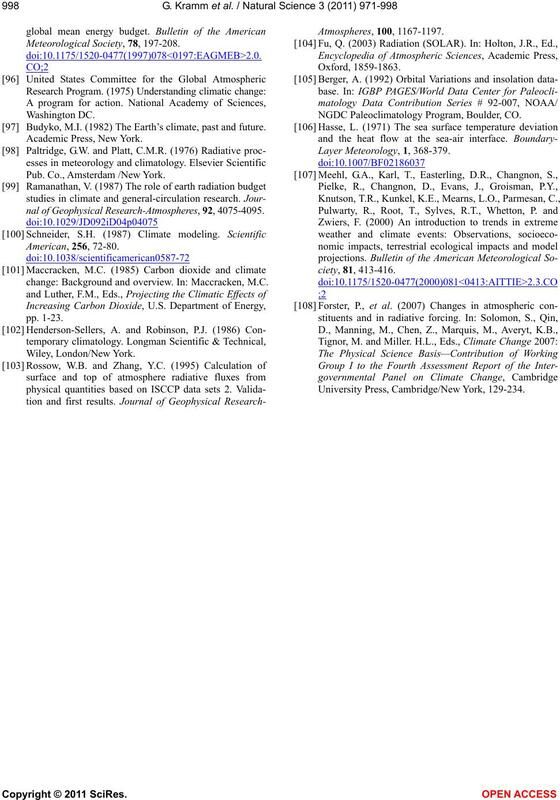 Meteorological Monographs, 29, 49-58.
stang, M., Houze Jr., R., Pielke Sr., R.A. and Woodley, W.
tems. 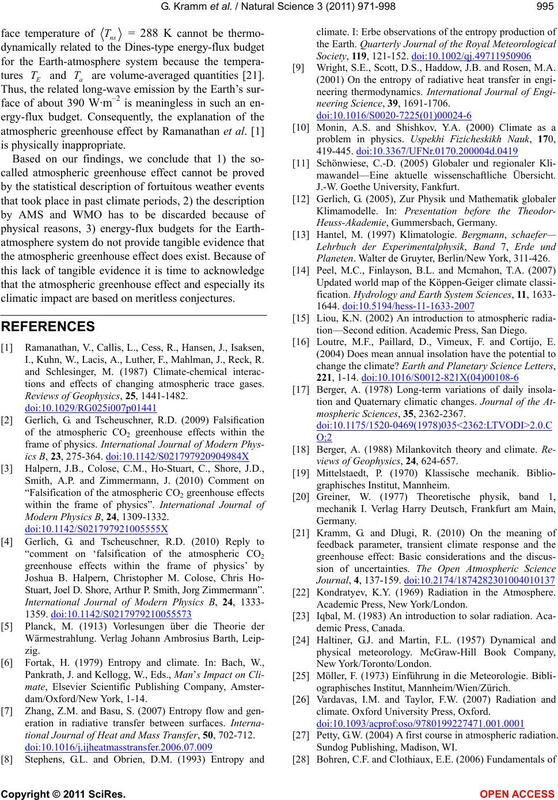 Meteorological Monographs, 29, 1-15. Fierro, A.O., Simpson, J., Lemone, M.A., Straka, J.M. circulation. University of Virginia, Charlottesville. Pielke, R.A. (1984) Mesoscale Meteorological Modeling. Braud, I., Dantasantonino, A.C., Vauclin, M., Thony, J.L. tion. 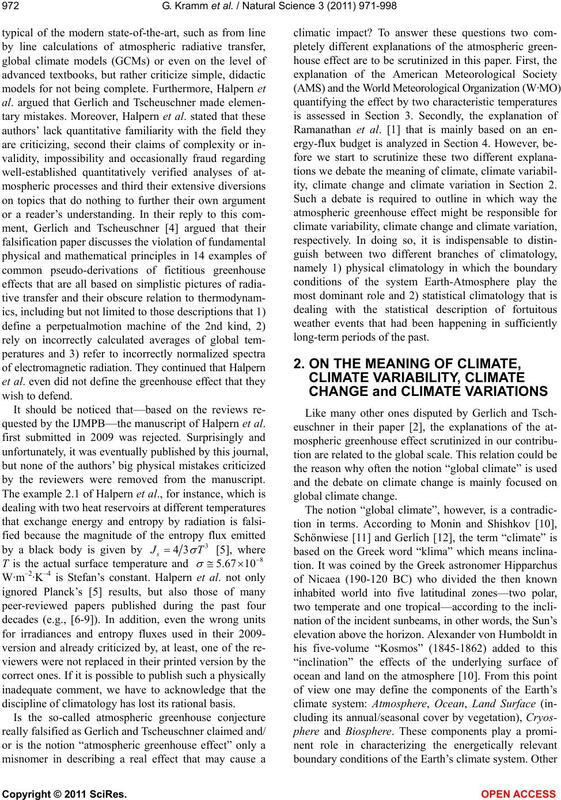 Journal of Hydrology, 166, 213-250. Kramm, G., Beier, N., Foken, T., Muller, H., Schroder, P.
 Pyles, R.D., Weare, B.C., Paw, U.K.T. 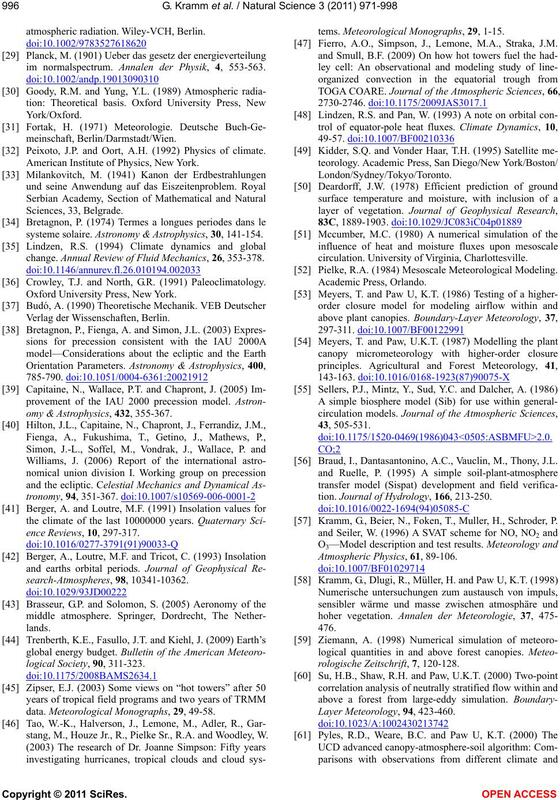 and Gustafson, W.
 Mölders, N., Haferkorn, U., Döring, J. and Kramm, G.
 Pal Arya, S. (1988) Introduction to micrometeorology. der temperatur aus der electromagnetischen lichttheorie. of the Calcutta Mathematical Society, 5, 27-61.
tivity: Analysis of feedback mechanisms. In: Hansen, J.E. Hartmann, D.L. 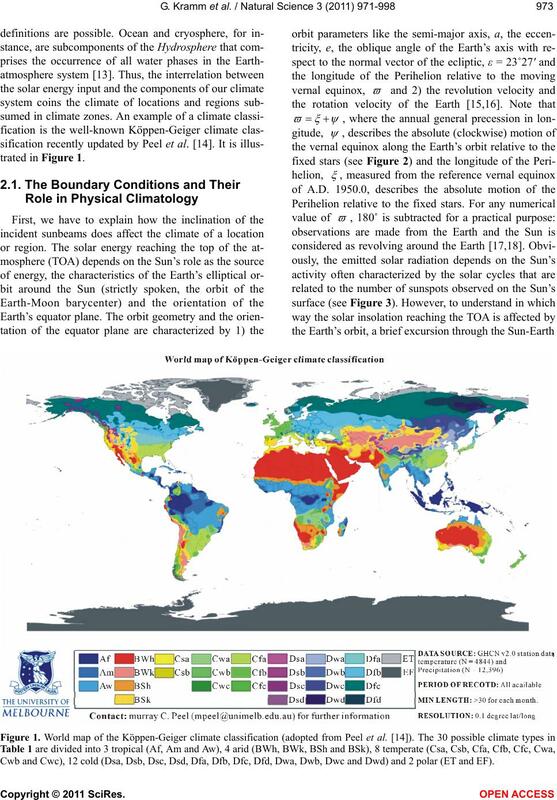 (1994) Global physical climatology. 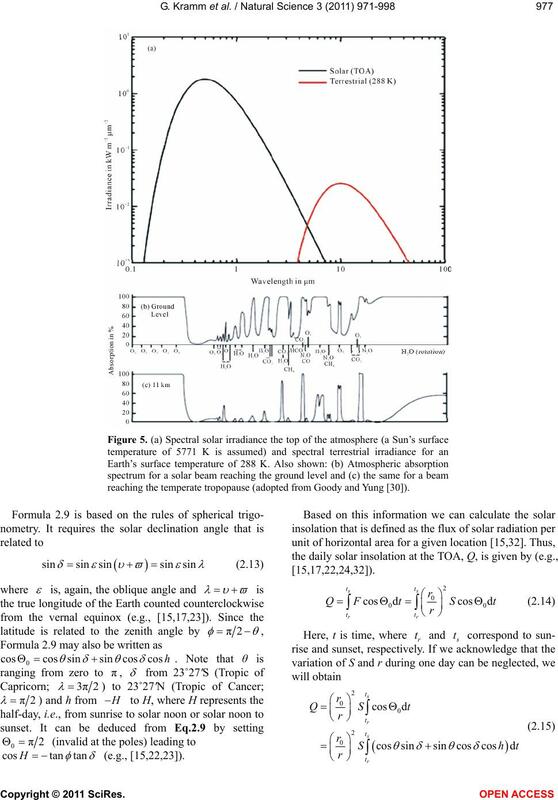 Mukai, T., Tanaka, M., Ishimoto, H. and Nakamura, R.
the stability of polar ice deposits. Icarus, 141, 179-193. Scientific Research A, 2, 63-77.
tary temperature. Physics Today, 64, 33-38. 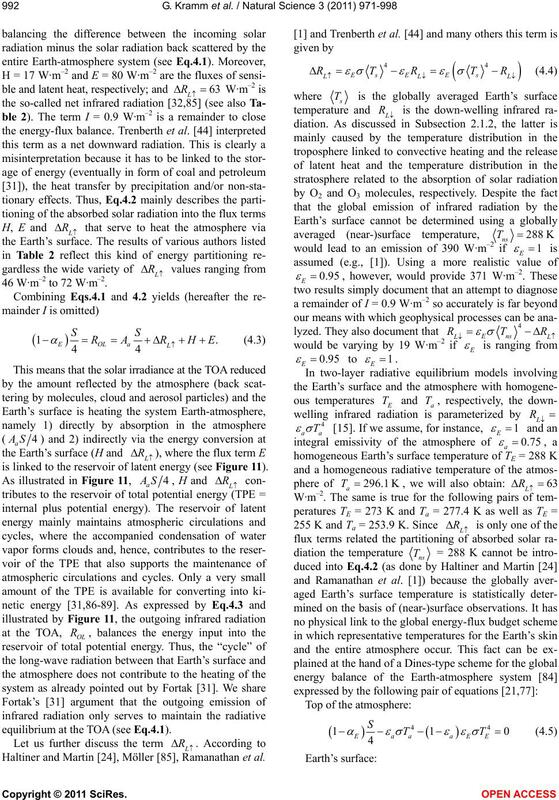 Lacis, A.A., Schmidt, G.A., Rind, D. and Ruedy, R.A.
erning Earth’s temperature. Science, 330, 356-359. Wien, W. (1894) Temperatur und entropie der strahlung. Annalen der Physik, 52, 132-165. Dines, W.H. (1917) The heat balance of the atmosphere. Lenoble, J. 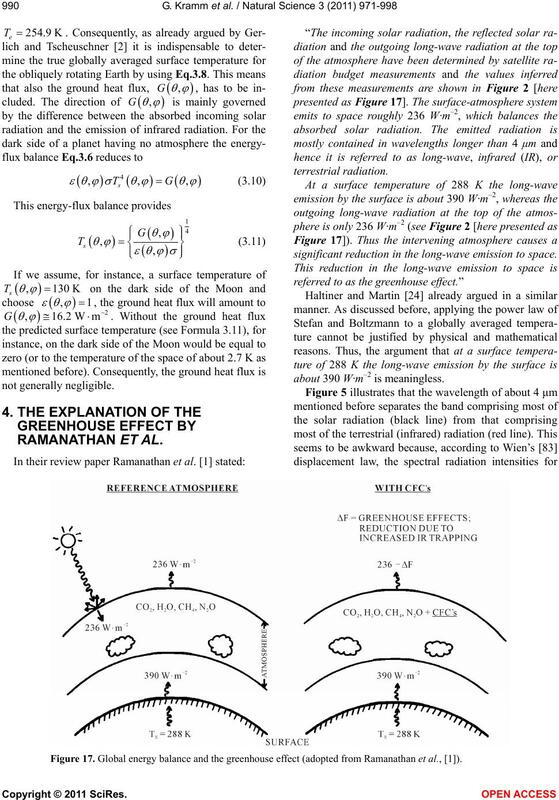 (1993) Atmospheric radiative transfer. A.
transparent planetary atmospheres. Időjárás, 111 , 1-40. Budyko, M.I. (1982) The Earth’s climate, past and future. Pub. Co., Amsterdam /New York. 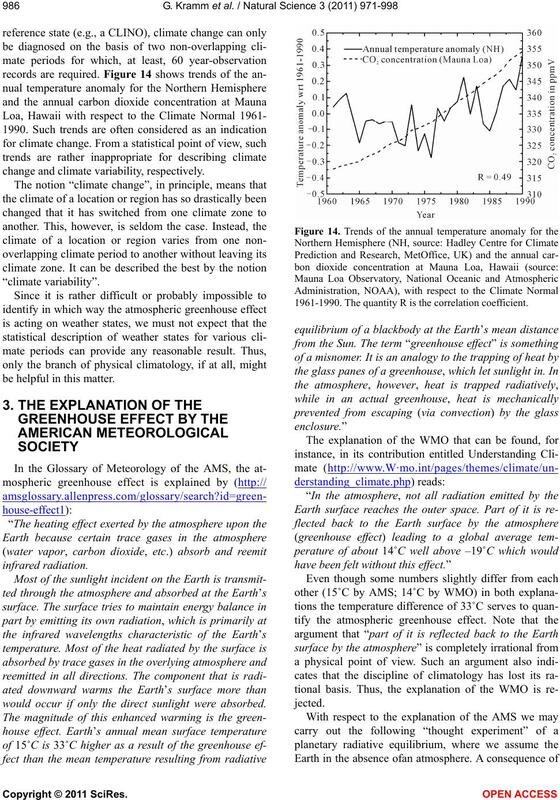 nal of Geophysical Research-Atmospheres, 92, 4075-4095.
change: Background and overview. In: Maccracken, M.C. NGDC Paleoclimatology Program, Boulder, CO.
University Press, Cambridge/New York, 129-234.